The pet list in battle shows "your" pet's name, not the general pet name, so people who bought Fire Vampragon while it was still Vampragon will still see it listed as "My Vampragon". Don't bother to sell/buy your pet. You are able to change your pets name in Aria's Pet Shop. The same is true of Giftboxes. Renaming your pet to anything that has a trigger in it (eg, Canine Warrior's boost to dog/wolf etc) will NOT trigger extra damage. The clones items do not trigger on their own, they only trigger when your character's item has been triggered. The clone's dragonblade/carnaxblade will never appear activated, same as with Dragonslayer shield, Nighthunter shield, and other activating items. When you buy or sell an item or move an item in your inventory, you are reequipped with your default inventory, including your default pet. Your guest is not affected. Galrick uses the base element of your weapon. He is not affected by some triggers. When you change pets, it is immediately your pet's turn to act. Anything that happens before the pet's turn (such as a Guest) is skipped. Galanoth triggers on Dragons, Drakel, Lizards, and Velociraiders. These are all Dragonkind. Twilly and Dragonslayer Twilly can heal you above your Max HP/MP. When you defeat King BURP, there is no option to take him as a guest; he always becomes your guest. Light Gatta (60) has a TD of 25, while Wind Gatta (35) has a TD of 40. E triggers on Name instead of Type. This means that he will trigger on some things he should not, and will not trigger on some things he should. There's no need to list which ones; they will all be fixed when he is converted to trigger by Type. DragonSlayer Twilly triggers on Name instead of Type. This means that he will trigger on some things he should not, and will not trigger on some things he should. There's no need to list which ones; they will all be fixed when he is converted to trigger by Type. Deery is not dismissed when Zardwarts Little Wand or Zardwarts Sturdy Wand is forcibly de-equipped by a shop. Weapons may be changed after that without dismissing Deery, until a Zardwarts Wand is equipped. The Squirrel of Order does not properly nerf defences. Problem: My pet is "stuck" and will not move up or down in my inventory. Solution: If a pet gets "stuck" in an inventory slot, logging out of the game and staying logged out for at least 12 hours will allow the game to fix the pet. Bug details: The Cloverfield War reward, Elder Myte, when it does its ranged attack, the sounds always came on before or after the animation started. Screenshot link: unable to get picture because the bug is about audio and animation. Galanoth does not have a 100% attack rate. At Keld 'Naer, at least. I am not sure of the other Galanoths. This does not appear to apply to other Gals from other areas. I've seen a bug with my clone pet. On some of the occasions where he attacks a monster it triggers absolutely no effect whatsoever. No mention of damage, no block, no miss or anything else. The monster doesn't do anything in response except its normal animation when standing there and no damage is recorded against its hit points. Is anyone working on a fix for this? Apparently there is a bug with the hyper nerfbat and it is continuing to nerf the monster and buff itself for more than the maximum 4 times. My Ring of the Dark Wood misc does not seem to be boosting the attack of my Trobble San (90) pet. I have tested it against the combat trainer. I got a hit of just 13. After bug: Everything the same , including the "bug"
Did the bug happen again? Yep , the same. Has this bug been reported before? I don't think so. Bug details: When the Moglo-Habilis "nerfs" monster stats, it actually increases resistances. Before bug occurred: A normal fight. During Bug: Moglo-Habilis did the "nerf" attack. After bug: Increased elemental resistances for the monster. Other Equipment: Male Drakel Disguise, Groundsplitter, Sheild of Rennd, Krenos (guest). @Mista_Jeab , the bug you reported is not really a bug , if you would like to look at the encyclopedia , at the Moglo-Habilis section (located here) you would see that it lowers the stats of the monster but raises the resistances. Bug details: When you are fighting a monster and NerfKitten attacks the attack where it raises it's resistances. Then if the monsters resistance to fire is for an example 100% then if the monster gets Frozen! the fire resistance goes to 200% then if NerfKitten raises it's resistances it goes to 212% but when it isn't frozen anymore it's resistance goes 100% again and not 106% like if it was attacked by NerfKitten. But all the other resistances works properly it's only Fire resistance that is the problem. And it also seems to happen even though it was nerfed before it gets frozen. During Bug: Monster gets frozen, NerfKitten raises it's fire resistance to 212%, monster isn't frozen anymore, fire resistance goes to 100% and not 106%. After bug: The stat isn't nerfed as it should be but can be nerfed again. Did you log out and log back in? Yes, and the bug always occurs. Did you clear cache? Yes, and it still happens. The Nerfkitten doesn't have a nerf cap! It can nerf four times, than four more for every time its resummoned! For some reason, the guest "Doom Wolf" summoned by the Necromancer class skill "Death Dog!" does not count as a familiar, even though it says in the description that it is a familiar. I noticed when I tried the "Wizard Games" challenge. When doom wolf attacked, a bubble appeared saying "This is a tournament. You must fight your own battles, although attacks from pets and familiars are permitted." Pet/Guest: Flying Eyeball summoned from Mage Class 'Summon Familiar'. Before Bug occured: Normal battle. so i wanted to try the other one,when trying to buy the Peridot one,a message say i have already one in my inventory (the one from emeral) so i selled the one i have,to take the new one..
i tryed to log out come back in,etc but nothing worked,is this a bug? Try to see if your answer is in the =Q&A= Fairwind Spring and Koofus. i dont know were to post this but it has to do with pets. Type of bug (Game crash/blackscreen, glitch, graphical error, typo, etc.):glitch? Bug details:i went to aria's new vampragon shop to buy a vampragon and i bought one. Before bug occurred:everything was normal. During Bug:i bought a baby vampragon even though it was guardian and i wasnt. After bug:went to buy another and saw it was guardian only. Other Equipment:protecter armor,rast axe,protector shield. Has this bug been reported before? Not that I have seen. Type of bug (Game crash/blackscreen, glitch, graphical error, typo, etc. ): Uh. . . glitch I think? Two times. Bug details: 1st time and 2nd time. 1st time: I was doing one of Aria's new quests, the one to get the Scree guest. My guest was another one of the ones from Aria's quests, the Therris. 2nd time: I decided to go to alnaphar to get the reign set. I went to Aria's pet shop and eqipped the new Scree guest, then used the travel map to get to alnaphar. During Bug: 1st time: I was fighting something (don't remember what it was) and the Therris disappeared! 2nd time: I was fighting a jester and the Scree disappeared! After bug: 1st time: I finished the quest to get the Scree and had to leave, so I logged out. 2nd time: Still fighting the jester. 1st time: New Therris guest. 2nd time: New Scree guest. Did you log out and log back in? Yes, the first time, but as you can see it happened again. Did you clear cache? Yes I did, the first time, but it doesn't help. Did the bug happen again? Yes, I have included both times, on two different days. One other thing: this only happens with the new guests, never the old ones, and I can't deliberately repeat it, it happens at random and only during a battle. Edit: Okay, it just happened again with the Scree again. I was fighting an undead paladin in the Alnaphar quest, I finished attacking, and when it was its turn to attack, it disappeared. My thundercat, Zag, immediately started his attack. I had the transformer armor, valor point, gilded shield and thundercat equipped. This is really getting annoying, it happened three times in two days! The Scree seems to be the worst offender. I hope this helps you fix this bug! Are you running out of SP? The guests take SP and disappear if you don't have enough to meet their upkeep cost. Ah, I didn't know that. That would be why. Thank you! Bug details: Whenever I enter a war-zone type area and am asked what guest I want to assist me, and I select "By Myself," the Automaton guest I brought with me vanishes as soon as its first turn to attack comes. 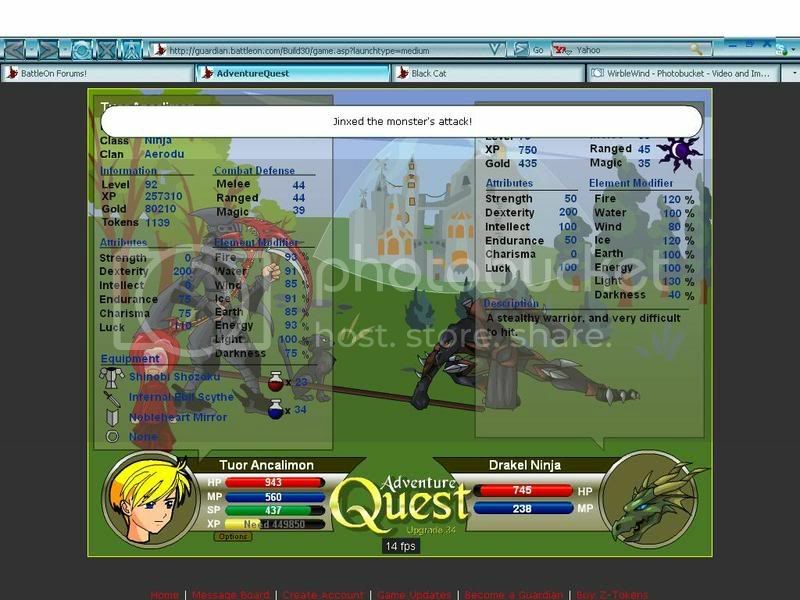 Before bug occurred: I went to Aria's shop, got the automaton, and went to the Gatta war against King Lionidas. I clicked the "battle" button, followed by the "by myself" button, and entered combat. My automaton appeared at the beginning of combat with that funky cinematic thing it always does. During Bug: I finished attacking, and my automaton's turn to move came. Instead of attacking, it just vanished off the screen. After bug: The automaton did not come back, and the battle proceeded as if he'd never existed. Other Equipment: Golden Plate, Golden shield, Blade of Awe, Clone pet. Did the bug happen again? Yes. EDIT UPDATE: The automaton is also disappearing when I do random battles and wearing entirely different equipment. Black widow brain spider's first attack does -12 bth to the monster if it connects. Then, it does the other attack until the 'sticky web' wears off. With each monster attack, some of the -bth effect gradually wears off. The spider only goes back to the web attack once the bth modifier is fully gone. However, if the spider misses the web attack it looks like the monster still recieves the -bth because when a monster attacks while having this effect the text box comes up saying "The Brainspider's webs have slowed your opponent"
2. Monster attacks and message appears "The Brainspider's webs have slowed your opponent"
So one of two scenarios presents itself. Bug scenario 1- The monster did not recieve -12 bth, but the game still wants to show the "The Brainspider's webs have slowed your opponent" message. Bug Scenario 2- The monster STILL recieved the -12, and then gets ANOTHER -12 bth on top of it. My Pygmy Frogzard Legion is never attacking.Vanished 25k for nothing?? Bug details: Pickled Punk - about 50% of the time it says "your opponent is paralyzed by the weirdness of the pickled punk.." It is not. Either it is supposed to say "your opponent resists paralyzation" OR it is supposed to paralyze but the bug doesnt let it.